As promised, I've decided to share some more NX information with you. This is second-hand information from trusted sources (like last time) and I have little reason to doubt its validity. - Backup data to Nintendo server (most likely My Nintendo). - Support for additional screen. - Can handle ports of current-gen games. - Will be able to interact with smartdevice apps. - Using NX software will unlock My Nintendo reward points. Nah, leave it open for any other news. Here some more NX rumours for you Mat, these ones are from NeoGAF. The big question is, have these anonymous sources been verified by anonymous NeoGaf sources? Matisfaction wrote: The big question is, have these anonymous sources been verified by anonymous NeoGaf sources? No, the guy got it from Reddit and that guy has been verified by them. They must have a superior screening process over there. When you think about it t's pretty much a formality at this point. the NX eShop (or whatever they decide to call it) will carry a Virtual Console service, so it makes sense to bring those games out. Again, with Wii U games most probably coming to NX VC you'll need a GamePad type controller, there's also DS and GameBoy advance games that work really well with it, Amiibo support, Plus a lot of people like off TV play. 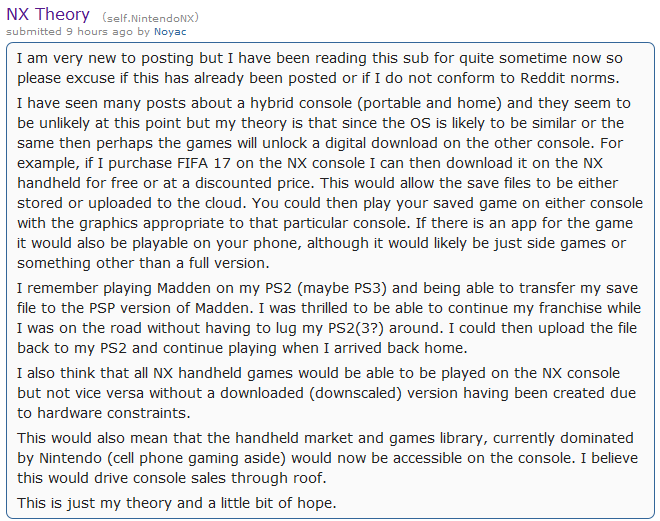 You are probably aware by now that NeoGAF member 10K posted a huge info dump for the Nintendo NX platform stating that the console will be more powerful than the PlayStation 4. Well, popular blogger Emily Rogers has stepped into the thread via a friend (she doesn’t have an account) and has revealed that the information on the GPU and power level isn’t correct. She also says that the gimmick posted was actually made up. Here is what multiple sources close to Nintendo are telling me about 10k’s hardware rumors: The gimmick is made up. GPU is wrong. Power level is wrong.” “The specs on NX are good, but a lot of the information being shared in this thread is incorrect. I was told that NX has good specs, but the info in this thread on the GPU and power level is just not correct. Sorry to burst everyone’s hype. Could be another Gamecube/Wii kinda deal, EA would be ecstatic with this! Matisfaction wrote: Not sure that you'll see the NX until 2017 either, Nintendo will want to push as many Wii Us as they can with the release of Zelda, an NX port has been nothing more than speculation at this point, basocally people putting two and two together (Twilight Princess Wii + GC release) and coming up with 2798. Unofficial data source VGChartz is reporting that Bayonetta 2 has sold over one million units since it launched back in September 2014. The game launched to critical acclaim and topped a number of end of year lists for the best video game of 2014. Bayonetta 2 is fairly cheap now so if you haven’t already picked it up I’d highly recommend doing so. Nintendo has confirmed it’s plans for E3 2016 and like they said it would be, it’s nothing but Zelda for the Wii U. There’s no hints at anything else – the booth, the Treehouse Live and well everything is Zelda. Nintendo says it will ‘transform’ its E3 booth to ‘immerse fans in the world of the newest game in The Legend of Zelda franchise’. The game is said to be playable at the show for the first time ever and will the only game playable in Nintendo’s booth with ‘extended demos’. So what about for everyone else at home? Well on Tuesday 14th of June local time (we’ll have converted times shortly) Nintendo of America President and COO Reggie Fils-Aime will introduce Nintendo Treehouse: Live. It will be dedicated to an entire day of live stream gameplay of The Legend of Zelda. Series Producer Eiji Aonuma has said that this new instalment in The Legend of Zelda franchise will be a clean break from the convention of previous games, removing boundaries that forced players to follow a set path and introducing new gameplay that has not been experience in previous games in the series. And that’s it, that’s the whole press release. No Digital Event, no Direct, no nothing. People have been moaning about not having any Zelda footage for ages, well now they've got it!